In port logistics there are numerous moving parts at any given time. From gateway logistics to transportation and delivery of goods to warehouse inventory management. The right technology will ensure rapid, accurate data collection and communication between transporters, dispatchers and receivers. 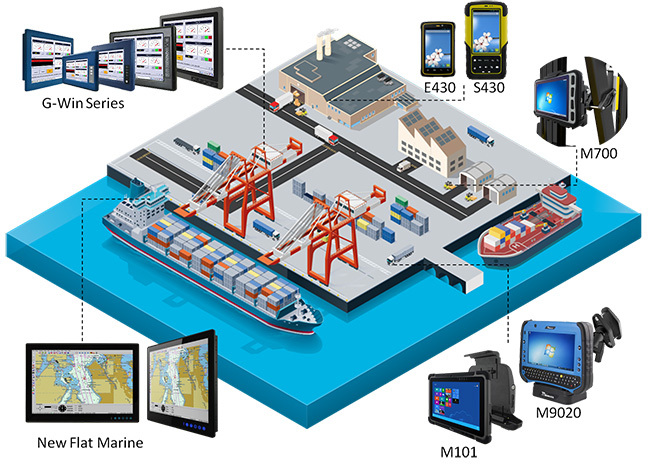 Winmate's full line of rugged mobile devices, ranging from handheld to fixed-mount, and ultra-rugged tablets, streamlines port logistics to optimize inventory management, track assets, and fulfill orders and deliveries. These devices where specifically designed to meet the demands of logistics and withstand the rigors of multimodal transportation. E430 Series : These lightweight, yet durable handheld devices features a sunlight-readable 4.3-inch multi-touch screen and user-friendly interface. Equipped with a 1D/2D barcode scanner, RFID reader, dual cameras, prevision GPS, and 3G for fast and easy communication, the E430 Series is ideal for the warehouse setting to track inventory and shipments. M101 Series : This tablet PC series automates operational efficiencies enabling increased material handling and cost reduction associated with handling delays. With a built-in 1D/2D barcode scanner, HF or UHF RFID reader, the M101B allows for easy tracking of incoming and outgoing shipments, while storing and monitoring inventory information in the warehouse in real time. This allows warehouse staff to check a shipment’s location status and locate inventory records instantaneously. The UHF-RFID enables longer read ranges and increased reading speeds to track large quantities from a greater distance. M700 Series : With the same asset tracking capabilities as the M101 and E430 Series plus integrated NFC (near field communication) capability, the M700 Series excels in data collection. This series also features robust processing power, continuous power with hot swappable batteries, and multiple wireless communications capabilities to improve productivity and efficiencies. M9020 Series : Custom-designed for rugged industries, this ultra-rugged, vehicle-mount series is ready to go to work in the most demanding environments. With matching asset tracking capabilities, a sunlight-readable 7-inch screen, Qwerty keyboard, and rapid processing power, this tablet can be quickly dismounted to scan assets, report locations, update inventory, and communicate with warehouse dispatchers in real time and in any location. G-WIN : This series combines a rich display with ultra-rugged design and rapid processing. The mountable, slim panel PCs offer a transflective, resistive touch 8.4-inch to 19-inch LCD display, readable in any light along with Intel’s Haswell Core processor. And with an aluminum die-cast case, the G-WIN series fits in any environment. New Flat Marine : The Winmate Marine Panel PC and Display offer flexibility, available in screen sizes ranging from 19", 24", and 26". Also built to survive shock, liquids, extreme temperatures, vibration, dust, and salt. The newly designed Marine Panel PC and Display delivers connectivity, and the ability to control and power multiple devices at once, while meeting IEC 60945 4th edition compliance, and DNV Certification (Det Norske Veritas).